…as 2019 cholera cases drop to single digit on heels of Presidential initiative says Deputy Mayor Chilando. The Deputy Mayor of Lusaka Chilando Chitangala says the drastic drop in the number of people dying from cholera to the low of seven cases this year from the high of 100 last year is directly linked to President Edgar Lungu’s vicious drive to clean up the city of Lusaka recently. 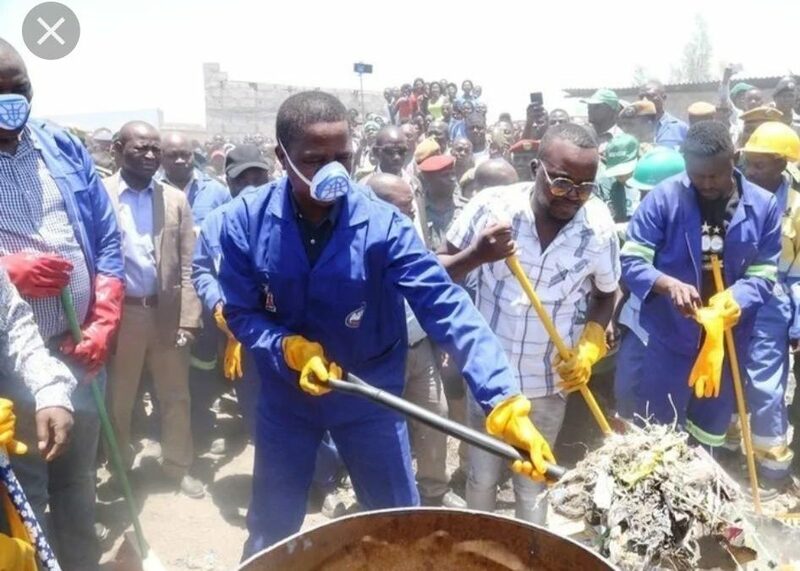 The Presidential led ‘clean up’ exercise of 2018 saw the streets of the capital being swept clean of uncertified perishable foods and other garbage being peddled on the streets even amidst a political uproar in order to save lives. “We must support the President by playing our individual roles and sustain the fight against Cholera by escalating and maintaining cleanliness and hygiene”, Ms. Chitangala said. The Deputy Mayor of Lusaka made the remarks in Berlin (Thursday) when a group of civic and private sector top officials paid a courtesy call on Zambia’s Ambassador to Germany His Excellency Anthony Mukwita at the embassy’s Axel Springer premises. Pictures of President Lungu casting aside his elegant suits to don working clothes and boots to get his hands dirty in order save lives and keep the city clean remain vivid on the minds of many Zambians and beyond to this day. The Zambian military and other government organizations followed the Presidential cue and escalated the keep Lusaka clean campaign like no other time. In his capacity as Commander-in-chief of the Armed Forces, President Lungu released both the army and the Zambia National Service into the streets and cleared them of street vendors and cleared rubbish heaps that had piled up uncollected. Conversely, the Ministry of Health conducted a robust anti-cholera vaccination drive against the waterborne disease for up to three years. Other measures that should see the efforts against cholera sustained include the on-going water and sanitation programs in which various local government authorities and Water utility companies are expanding their water treatment and distribution infrastructure. For instance, under the Millennium Corporation Challenge, a water and sanitation project worth over 350 million dollars has seen a 5-million-liter water tank in Chelston, which should service 24/7 surrounding areas such as Avondale and many others with the lifesaving liquid. This week, a nine-member delegation sponsored by GIZ, a German international development agency arrived in Germany to discuss the possibility of extending funding support for water and sanitation programs in Zambia that the Germany has been supporting. The delegation included Mr. Kelly Kashiwa, District Commissioner for Kasama, Mr. Amon Chisenga, Mayor for Ndola, Ms. Chilando Chitangala, Deputy Mayor for Lusaka and Mr. Wisdom Bwalya, Town Clerk for Ndola City Council. Others are Mr. Peter Chilambwe, Assistant Secretary, Lusaka Provincial Administration, Mr. Laurian Haangala, Director for ZACCI (Zambia Chamber of Commerce and Industry, Mr. Jonathan Kampata, Managing Director, Lusaka Water and Sewerage Company and Mr. Ezekiel Sekele, Corporate Affairs Director, Zambian Breweries. Ambassador Mukwita shared selected development programs that underpin the Zambia-German relations that include investment in the energy sector and in the health sector where Austria is interested in upgrading the cancer hospital and consequently reduce deaths related to the disease. Ambassador Mukwita that the City Fathers did well to expand on President Edgar Lungu’s keep Lusaka Clean campaign, “because it is criminal in our view that people should die from preventable gastro intestinal diseases today such as cholera simply keeping surroundings clean. He told the delegation that Zambia continues to enjoy great relations with host country Germany.